We’ve all seen them. 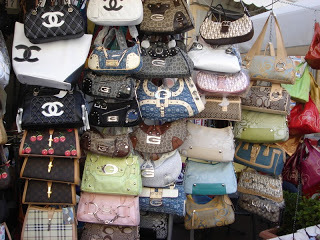 Fake Rolex watches, Prada handbags and Ralph Lauren shirts, adorning market stalls the world over. But did you know that pirated and counterfeit goods are estimated to cost businesses more than £161 billion every year ? Counterfeiting designer goods might sound like a crime that DOES pay, but is one that many governments are publicly clamping down on. 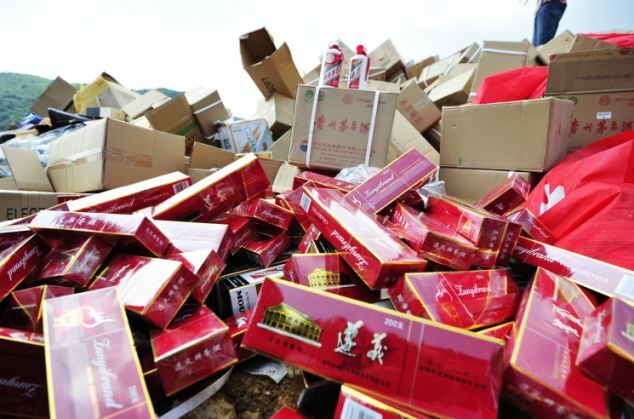 From burning a pile of counterfeit good in China, to an announcement from the UK’s Intellectual Property Office that if found guilty, offenders could spend up to 10 years in prison, its clear that counterfeiting continues to hit headlines. This increase in demand has led to some good news stories – artisan craftsmen are starting to benefit from this fashion-industry-led heritage textile resurgence. Japan has become the biggest market for Harris Tweed, with the country snapping up ~40 % of the products exported from the Scottish group of islands. And in Donegal, Ireland, another famous bastion of tweed production, the story is very similar, with a growing interest from the Asian market. 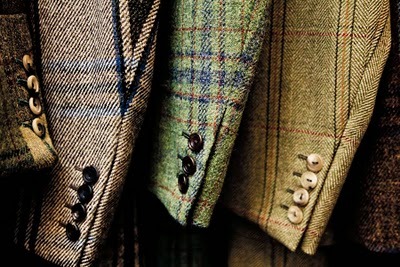 So, this all got me thinking – how can you check that any tweed you buy is the real stuff? How can you differentiate between a fabric which is 100% wool, and one that is synthetic (or a synthetic blend)? 1. The burn test: This came up time and again – it involves taking a snippet of the fabric, setting it alight, and watching how it responds. If it is a wool, it will char and smell like burnt hair, but it won’t fully ignite. If any synthetic fibres are present, the fabric will burn quickly, and may melt or drip. So, it should be easy to distinguish between natural and synthetic fibres, but it seems a little basic, and is obviously destructive, which may not be an option for customs officers or concerned customers. DNA-marking fabric is a fantastic idea. The chain of (plant) DNA cannot be copied, shows impressive stability even in harsh environments, and can be applied to the fabric at any stage of the manufacturing process. So you can see how this would be extremely useful in the most serious of fraud cases. But practically, this technique sounds pretty complex. The DNA marker can only be identified by the company that applied it. Now this certainly provides excellent traceability to the process. But it also probably means that a customs officer cann’t get an immediate result – it couldn’t be used to quickly determine if a roll of textile is genuine. 3. Terahertz laser spectroscopy: Now I must admit, I didn’t have to go very far to find out about this technique – this work is being led by a John Molloy, friend and ex-colleague of mine from NPL. The theory is quite straightforward – different types of fibres display different optical properties (in the terahertz range). By knowing the terahertz response of a range of textile types, it is possible to identify which fibres are present within a sample. Terahertz (THz ) radiation is often called “sub-millimetre”, as it falls between microwaves and infra-red light. The NPL system involves placing a sample of the textile within the beam of a terahertz laser. 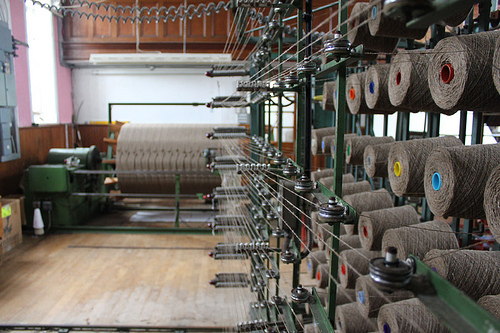 The individual fibres that make up the textile produce different rates of scattering and absorption of the THz beam. If you know this response for a range of natural and synthetic fibres, it would be possible, from the measured transmission profile, to determine whether or not the fabric is counterfeit. This THz laser system doesn’t just apply to wool. John and his colleagues also examined linen, cotton and silk and fabrics containing mixed fibres, all of which demonstrated distinct terahertz transmission properties. Their system is so sensitive that it can even differentiate between ‘standard’ and merino wool, as well as between natural and synthetic silk. Tests can be carried out quickly and safely, and the textile doesn’t suffer any damage from being illuminated in the beam. Now, you may say that I am biased, but I think this is a fantastic project. It shows how fundamental science can be applicable to the outside world. It shows that research can have a positive impact on people’s quality of life. And it shows that most scientists really don’t want their work to stay in the lab – they want it out there, making a difference. Really cook stuff. But I find the £215 billion number hard to believe. Ooops, realised that I converted € rather than $ to £. Updated!